Foal Assist is a nutritional supplement from Bailey's for foals where the dam has poor quality milk or for rapidly growing foals. 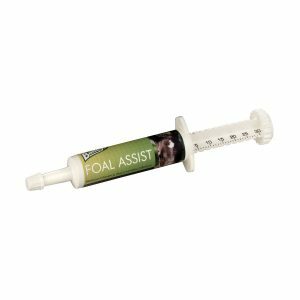 Foal Assist has been formulated for suckling foals to supplement the micronutrient levels of the dam’s milk, particularly when she is producing milk of poor nutritional quality. It is also suitable for rapidly growing foals and supplies the additional nutritional support they need without the extra carbohydrate, which would be provided by traditional creep feeds. It comes in an easy to use syringe. Composition: Soya oil, vitamins, minerals and grape seed solubles.